Our Abpromise guarantee covers the use of ab116535 in the following tested applications. Shipped on dry ice. Upon delivery aliquot and store at -20ºC. Avoid freeze / thaw cycles. 12 % SDS-PAGE gel showing ab116535. 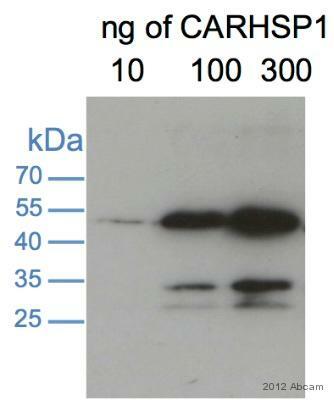 Review text: We used this HA-tagged CARHSP1 protein only as a control to quantify our own HA-tagged proteins on a Western blot. For this it worked well, although there are weak degradation products as well as the main 44 kDa band for CARHSP1. Treatment: diluted in 0.8M Tris, 0.2M sorbitol, 1% betamercaptoethanol, with bromophenol blue. Added 1% SDS then boiled for 5 min. Additional Notes: Non-specific bands (30, 35kDa) may be due to degradation.